← Where are all the swarms this year? I pulled the block away and returned 10 minutes later. Most, perhaps all the fanners were gone and the entrance simply a normal bustle of activity. It’s worth mentioning these hives’ floors are sealed, the entrance is the main path for air to circulate through. Some beekeepers prefer open mesh floors, but these increase energy requirements in cold weather, and allow small parasites to hide below them; I prefer the bees to have access to a solid floor, allowing them to clean it themselves and kill or expel parasites. Bees didn’t evolve with mesh floors. You also see fanning when a swarm is entering a cavity, where workers raise their hindquarters and fan air backwards over their Nasonov glands to release a “come here!” pheromone. 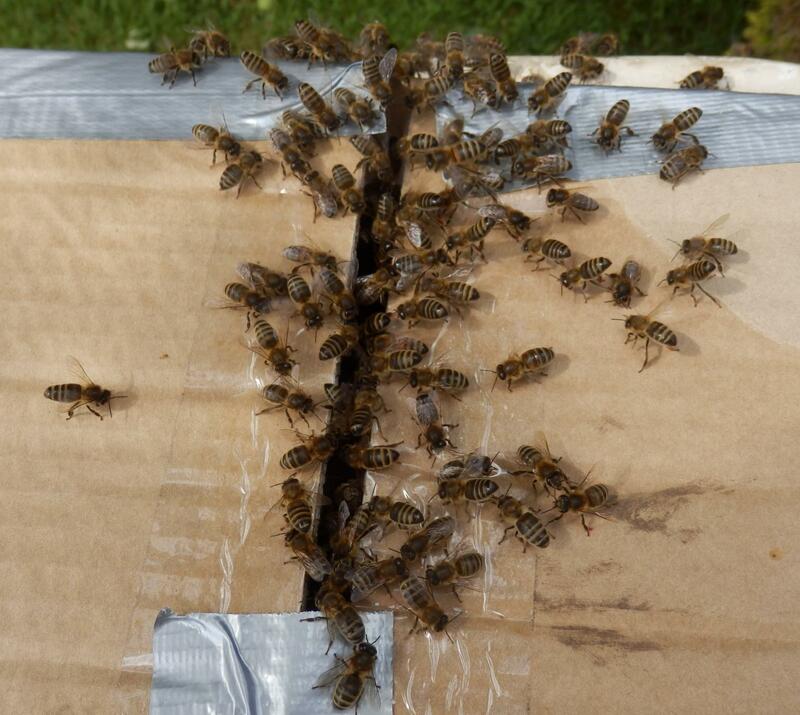 It looks similar (see picture left – many bees pointing to where the main cluster & queen have entered a capture box). The only other time they do it that I am aware of is when a new queen goes on a mating flight, and the colony left behind again fans Nasonov pheromone into the air from the entrance to help her find her way home. This entry was posted in Warré and tagged cooling, Fanning. Bookmark the permalink.